Your Caledon home needs proper insulation protection that meets current Building Code standards. If your Caledon home was built before the Ontario Building Code was revised in 2017 and the insulation has not been upgraded since then, your home does not meet the current R-value standard of R60. Attic insulation is an important part of a safe and healthy roof system for your home. VK Roofing is a trusted, experienced Caledonia insulation installer. We are proud to be a certified Owens Corning insulation installer serving Caledon. 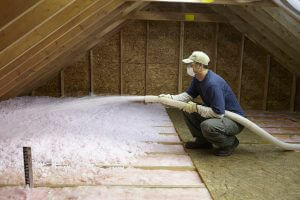 We use AttiCat, Canada’s #1 insulation brand, from Owens Corning. Contact owner Anthony Van Kooten for a FREE No obligation quote in Caledon for insulation.